Gorgeous!! Absolutely LOVE them. I will be purchasing 2 more!! They are exactly as pictured and as described. I also bought them in silver and they are just as amazing as in black!! 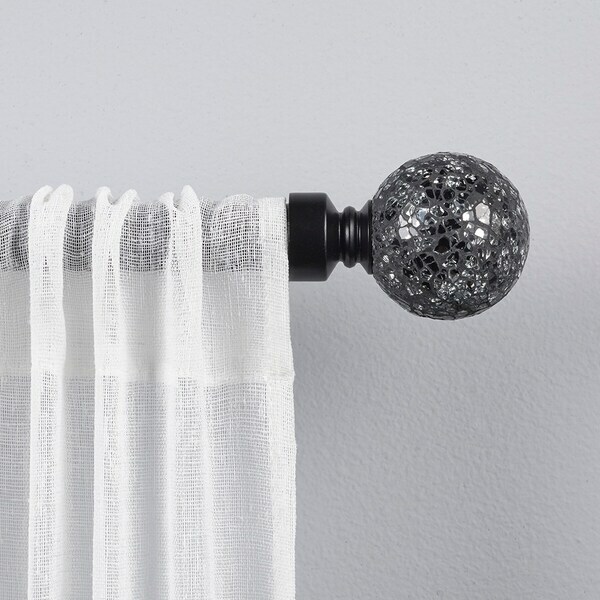 The Black Pearl Mosaic decorative curtain rod and finial set provide a high fashion and glamourous style with a matte black finish rod and textured acrylic glass finials. With dark grey and charcoal undertones, these finials are reminiscent of a luxurious black pearl. This set will provide a visually balanced appearance for your window treatments. The 2.5" diameter x 2.4" long finials will insure that your window curtain panels will remain securely on the rod. The 1" diameter iron adjustable curtain rod is designed to fit a wide range of window widths, and has a sturdy 25 lb. capacity that will support flowing sheers to thermal blackout panels. The 3.5" fixed depth projection bracket provides a gracious amount of space for fabrics to drape perfectly. Accommodates window curtain panels and drapes that are designed with various tops, including: rod pocket, pinch pleat, grommets, tab top, or hidden back tab top. Provides an attractive accent to every window treatment in your living room, bed room, bathroom, kitchen, and kids room. Installs easily with included hardware and installation instructions. Sturdy, easy clean, no fuss, wipe clean finish will last for lifetime. This window curtain rod and finial set will add the perfect finish accent to any window treatment and adds a refined style to your home decor. This mosaic curtain rod is GORGEOUS!!! The picture online does not do it justice! I love it!! I had a slight concern that the ball would be too small, but, it was the perfect size!